Recognizing the Smithsonian National Museum of American History in Washington, D.C. as the home for some of the greatest modern creations conceived by equally as great intellects, it will surprise Smithsonian observers that dummies will now be on display. Although dummies, these two particular individuals spent much of the 1980s and 1990s educating American road-goers on the values of traffic safety. 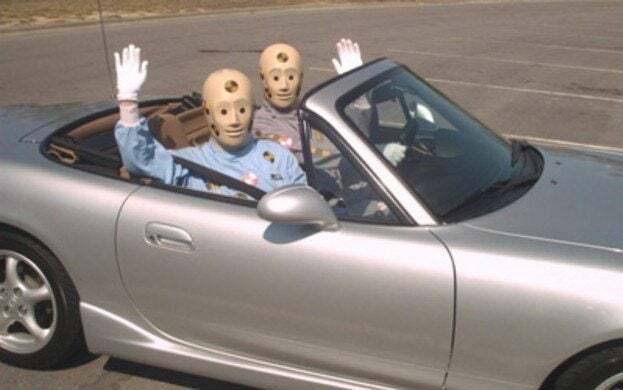 First brought to the air waves of television 25 years ago by the National Highway Traffic Safety Administration (NHTSA), two crash test dummies named Vince and Larry (known collectively as the Crash Test Dummies) were commissioned to advocate automotive safety. Chiefly promoting the use of seat belts through their public service announcements, Vince and Larry’s light-hearted but still stark illustration for the effects of a car crash without using proper safety. Unlike the more literal traffic safety messages performed in today’s PSAs, the Crash Test Dummies education combined information with physical comedy and even rap. Before concluding their stint as ‘spokesdummies’ for the NHTSA in 1998, the ‘Crash Test Dummies’ fame was briefly parlayed into a children’s cartoon and a toy line where they were called “The Incredible Crash Dummies”. Despite Vince and Larry’s retirement, the NHTSA as well as the U.S. Transportation Secretary Ray LaHood acknowledge their contributions as a lasting impact promoting safe driving. “They are a part of American culture and became household names while educating the public on seat belt use. Their message still holds true today.” Secretary LaHood stated. In honour for their 25 years of promoting road safety, the Crash Test Dummies Vince and Larry are headlining additions to the Smithsonian’s National Museum of American History new exhibit profiling 75 years of Auto Safety. The NHTSA donated the original dummy costumes for display in a special ceremony July 14th reuniting to the program’s actors Tony Reitano and Whitney Rydbeck for the event. Added to the Smithsonian as a permanent piece to the National Museum of American History, Crash Test Dummies original costumes are joined by other automotive safety items including a 1948 Tucker Torpedo as well as early examples of the seat belt and padded dashboard. The fictional ‘Crash Test Dummies’ will also be in the company of a real General Motor Hybrid III dummy. No Comments on "Popular Crash Test Dummies Impact Smithsonian"